Actor Robert Hook, original pic then rotated and aspect ratio changed to make it similar to arcade flyer. "Nostalgia is rose-tinted; keep your contribution chatty, informal, and positive." Magazine writer who wanted to hear only good things about coding old games. The Robert Hook image doesn't match. There is a vague general resemblance, but the specific features don't match up: eyes, mouth, nose, hairlines, etc are all different. There are a few examples in this thread that are a bit of a stretch and then some. But this is not even close, totally different facial structure. Robert Hook looks a bit more like the cop in question but I'm pretty sure he's not the model either. I'm not saying for definite that it is a match, nor am I saying the pic I posted was used in any way as a template, I could have used Raymond St. Jacques for example from 'Come Back Charleston Blue' instead and given more time to go through my blaxploitation films likely many others. It's just to point out that it's a possibility and not a certainty. The yellow car on two wheels flying over another car could just as well have come from the Midas VHS cover of Franco Nero's 'The Marseilles Contract' - it's all subjective in the end. It's obvious the artists involved in all these Game Arts did some tweaking to whatever they used as source material to avoid accusations of outright plagiarism, be it removing a moustache and changing the fingers or flipping lips and amending a hairstyle. Unfortunately a lot of this went on with video covers, one company being "inspired" by another, so unless it's a pretty definite looky-likey then it's a toss of the coin thing as to which source material was actually used. Swarthy guy with sunglasses and a big gun looking mean, 'Cobra' or 'Enforcer 2'? Bare chested dude with a bandana, knife and a big machine gun rescuing prisoners from the jungle, 'Rambo' or 'Slash'? It looks like a pretty good resemblance to me. I set both images to 50% transparency and overlaid them. They lined up almost exactly, though you have to look pretty carefully, as it's a little hard to separate the two images when they're static. It's much easier if you are moving them around. The top half lines up exactly, as does the bottom half, but the two halves are slightly out of synch. For comparison I did overlays with the Robert Hook and Bill Cosby images. They lined up much less well, though again it's not that easy to see without moving the images round and trying to fit them together. The hairlines are different, the eyes don't line up, the nose tips are in different places, the ears are very different. Some small differences are to be expected, but these are huge. These two didn't line up at all. 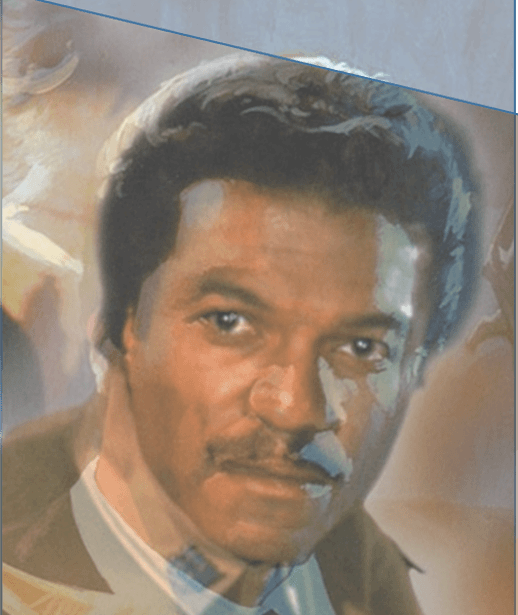 I was sceptical about the Billy Dee Williams image at first, but I think it stands up to scrutiny. I feel pretty confident it is the source (or very close to it - maybe an image a few frames either way). I appreciate the overlays might all look like blurry messes, but if you have a go yourself to align transparent versions, you can see more clearly. I think you may be getting caught up too much in the need to find an identical image, exactly the same photo, whereas I'm trying to point out it's down to similarities in actors in general. If you want a nonsensical example then Billy Dee Williams can't be the model for Chase HQ because in that picture he has a moustache and the arcade flier version is clean shaven. QED. Once you start allowing for fudges like that then you have to apply it to others as well, so if Williams can have his tache digitally removed then other pics can be allowed similar manipulations. So to clear the air: No, I don't believe the Robert Hook pic I posted was used for Chase HQ but - as someone else pointed out - Hook looks a lot more like a possible model for it than Williams. Ignoring the fact that I said "definitely not the faces" for Bill Cosby I can keep posting similarities between actors (not ignoring the original post that Philip Michael Thomas was the actual model which I tend to agree with) but it's not worth it. I can say that the following pics of Raymond St. Jacques and Calvin Lockhart absolutely weren't used for Chase HQ just as I can say that a younger\older\different pic of them or Hook MIGHT have been the model. I can't give a definite on the latter, I can only point out alternatives to a supposition. I think your arguments have more holes than a sieve, but I can't be bothered with this anymore, either. There are better things to do. Rorthron, it would be a shame if this stopped you, as you've found a lot of obvious copies, and I appreciate your work! I think Rorthron is right after all, it's Billy Dee Williams. I found the promo photo that was most certainly used. The shadows, lighting and angles seems too good a match not to be the reference. Was really hard to see the likeness in the photo Rorthron posted though. I think there's a fair chance Billy Dee Williams was the reference for this. It's not at all clear from the inlay cover, but it shows up a lot more in the less glossy arcade flyer. If it is true, I wonder why they felt the need to take both from Star Wars? There are better things to do. Stop perving at Raquel Welch!